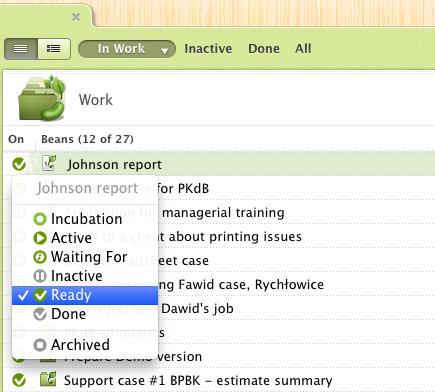 In our newest Beanflows 1.6.0 release we’ve added new bean status ‚Ready’. As you know bean statuses represent the stages of the process of outcome achievement: sowing, growing, shaping, maturing, and harvesting. This new addition allows you to fine tune the final stages of bean life – harvesting a bean. It was Done-Archived sequence before, now is Ready-Done-Archived. Beanflows 1.1.3 is available on App Store now. This update includes lot of bug fixes and optimizations. To get this version open App Store click ‘Updates’ icon and then ‘Update’. You may be interested in the content of this update. Check out details on Changelog page. And remember, get your free update in the App Store.